For income stock investors, the best defense against stock market downturns is to own shares in companies that periodically increase their dividend rates. Focusing on a growing income stream changes how you think about stock prices. REITs are active businesses where the good ones are managed to grow income and the dividends paid to investors through the full stock market bull and bear cycle. Buying stocks just before they announce a dividend increase provides an attractive opportunity for quick share price gains along with larger forward dividend payments. In the market sector of real estate investment trusts (REITs), we can monitor how well an individual REIT is performing from its history of dividend growth. In the long-term, REIT results are primarily driven by economic growth. In the U.S. the growth rate continues to expand. Another positive for REITs is that they are not exposed to the challenges of international trade. Most REITs announce any dividend increases once a year, in the same month each year. Across the sector there are increase announcements in almost every month in the calendar. You can often get a nice share price gain by buying shares before a dividend increase announcement hits the news wires. I maintain a database that covers about 140 REITs. I use the database to track dividend rates, yields and increases. 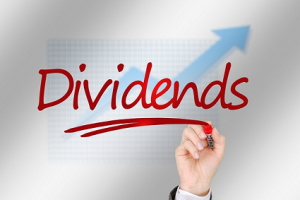 Of the 140, about 90 have histories of regular dividend increases. There are three REITs that are likely to announce a dividend increase in May. Agree Realty Corporation (ADC) is a net-lease REIT which focuses on the development and acquisition of single tenant retail properties. The company only leases to industry leading retailers. Currently Agree has a portfolio of 645 properties. in 46 states, containing approximately 11.2 million square feet of gross leasable space. 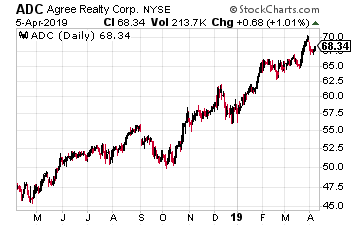 This is a growth REIT. In 2018, the company invested in 225 new properties and sold 21. For the last three years, ADC has announced a dividend increase twice a year, in December and May. In prior years, the company announced an annual payout increase in early May. In December, the dividend was boosted by 2.8%. With the rate of FFO per share growth, it is possible for another 3% increase next month. The dividend announcement will come around May 20 with and end of June record date and payment in July. 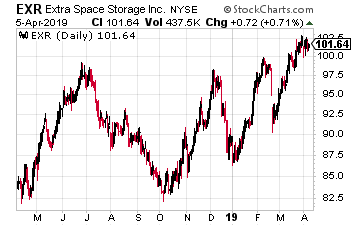 Extra Space Storage Inc. (EXR) is a large-cap, S&P 500 component company that owns 882 self-storage properties. This REIT also provides management services for independent self-storage property owners of 536 properties and has joint ventures in 229 properties. Extra Space has been a growth focused REIT since it was founded in 1995. Over the last five years, the company has made $4.6 billion of acquisitions. Over the same period, it has rewarded investors with 115% of dividend growth. However, profit growth in the self-storage sector has slowed over the last two years, as developers have overbuilt self-storage in many of the major metropolitan areas. However, EXR has bucked the sector trend and increased the dividend by 10.3% last year. It is very possible that the Board of Directors will announce a high-single digit to low double-digit increase next month. The dividend announcement will come on about May 25, with record date in mid-June and payment at the end of June. EXR yields 3.4%. 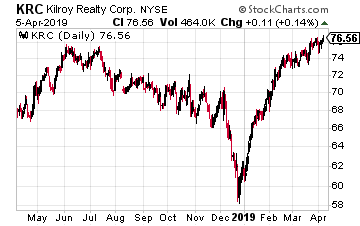 Kilroy Realty Corporation (KRC) owns office and mixed use commercial real estate in the major cities of California and Seattle. The company acquires Class A type properties through both development and acquisition. I view this REIT primarily as a development company. The goal is to own properties that have high barriers to entry from competition. For 2019, the company has issued FFO guidance of $3.68 per share at the midpoint. The current dividend rate is $1.82 per share, very close to half of FFO. Last year, Kilroy increased its dividend by 7%. The next increase will come on about May 20, with an end of June record date and payment in July.